How does one adequately describe an Abyssinian? “Alert, highly intelligent, athletic, playful, and people orientated” are just a few of the words that immediately spring to mind. Considerable speculation and some controversy surrounds the breed’s origin and history. Considered to be one of the oldest cat breeds, it does resemble some of the cats depicted in ancient Egyptian paintings. Known as the “Child of the Gods” the Abyssinian is considered by many to be the descendant of the sacred cats worshipped in the temples of Egypt. This folklore tells us that the male cat represented the sun god “Ra” and the female cat represented the fertility goddess “Bast”. One taxidermal example of an Egyptian cat can be viewed in the Museum of Natural History at the Smithsonian Institute at Washington D.C. and this cat bears a striking resemblance to the modern day Abyssinian, both in musculature and colour, but especially in its “ticked” coat pattern with rufous base. The name “Abyssinian” does not refer to any known fact confirming the origin of this breed as being from Abyssinia (now Ethiopia), but because the first cat so-called “Abyssinian” was exhibited in England and was reported to have been imported from that region. It is known however, that British troops left Abyssinia in May 1868, so there existed a distinct possibility that cats displaying these distinctive coat characteristics may have entered England about that time. One such example, a female named Zula, was reported by Dr Gordon Staples in 1862 to have been gifted to Mrs Barrett-Leonard, the wife of one of the troops stationed in Abyssinia under the command of Sir Robert Napier. Sadly, there are no verifiable records to trace early Abyssinians to cats from this period. The Abyssinian has also been known variously as the Russian Cat,(from cats which migrated from the North of India), the British Ticked cat, (after the superficial resemblance to the ticked coat of rabbits), and the Spanish Cat, (probably because it had migrated on the trading ships that plied between Spain and Ceylon). Genetic research demonstrates that the most credible origin of the Abyssinian is the coast of the Indian Ocean, where it seems probable that purchases from suppliers of small wild animal exhibits could have been made by colonists. Of one thing we can be certain, the future of the breed was assured with its rise in popularity in Britain. 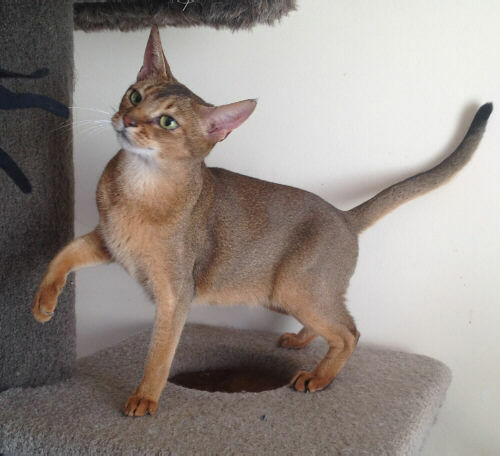 One particularly well-known early Abyssinian was “Aluminium” born in 1905, owned by Mrs Carew-Cox. This male appears on many of the early recorded pedigrees. A son of “Aluminium” named “Aluminium II” born in 1907, was exported to the United States. Under the stewardship of British breeders, the survival of the Abyssinian cat as a recognised breed was not only secured, but a healthy demand from overseas saw examples exported to all corners of the globe, where it took a particularly strong hold in the United States, Canada, Australia and New Zealand. The first Abyssinians came to New Zealand in 1955, imported by Zita Curran of the famous “Finisterre” cattery in Auckland. Her stud male, Selbourne Catalpa was said to have been at that time, one of the top three Abyssinians in Britain. The esteem in which the New Zealand public holds the Abyssinian, has continued to grow steadily over the last 45 years, due largely to the very loyal following by New Zealand breeders. The Abyssinian remains a very popular pet and show cat. Regarded by many as one of the most intelligent of cat breeds, it is very people orientated and personable, a winning combination for any cat lover! The warm rufoused undercoat of many is also very attractive and combined with the definitive “ticked” pattern, creates a cat with a sparklingly distinctive look to go with its sparkling personality. CATZ Inc recognises this breed for full Championship Status.